This planter DIY is actually a part of a virtual #DIHWorkshop party with some really amazing bloggers and The Home Depot! 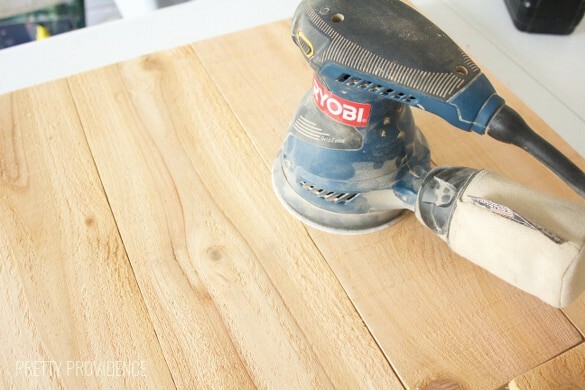 Here’s a little background on it: The Home Depot offers workshops at all of their locations, and there is something for everyone whether you’re a DIY veteran or you have never touched a power tool before. They are designed to provide a mix of instruction, demonstration, and hands-on learning. Right now you can sign up to make a rustic pumpkin stand at their “Do-It-Herself” Workshop. For this party there are five hosts, and Brooke from All Things Thrifty invited me to take the basic design of a rustic pumpkin stand and make it my own, and our team was assigned to make it fit a guest room! 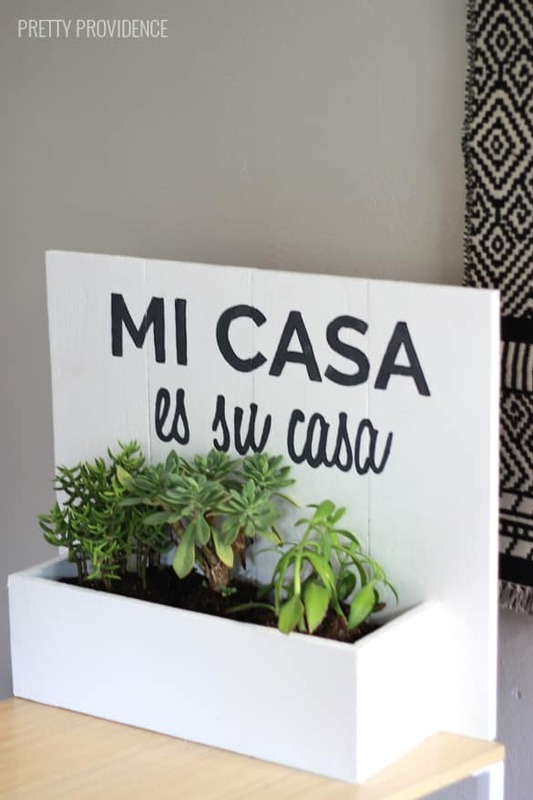 I decided instead of making it a pumpkin, I’d just make it a rectangle box and make it extra welcoming by painting “mi casa es su casa” on it! I used all of the same materials though! It was surprisingly easy to make and only required a few tools. 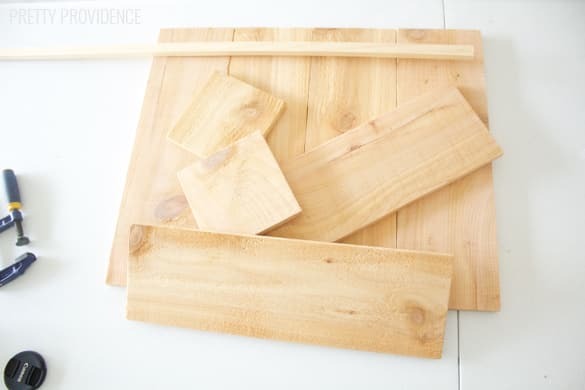 I didn’t want mine to be super rustic so I sanded my wood a lot more than I needed to… that’s optional! Then I gave it a couple coats of white paint. My favorite white is Behr Marquee “Polar Bear.” I printed out the words, cut them out and traced them onto the wood with a pencil. 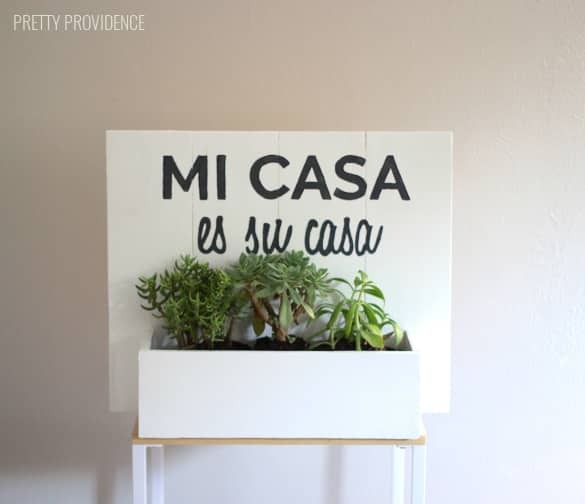 Then I used a black chalk paint to paint the “mi casa es su casa.” Fonts used: Raleway and Honey Script. Anyway I am loving how this turned out! I hope it will make all of our guests feel extra welcome when they come. I love how the succulents add some color to the room too! I have a real thing for black and white everything so plants keep me from having a completely monochromatic home. So have I convinced you yet? Sign up to make one of these cool wooden stands for yourself at this link! All materials you’ll need can be purchased at the store too, and they total up to just $25! Also, make sure you check out all the other interpretations of this in the virtual party. So many amazing ideas! 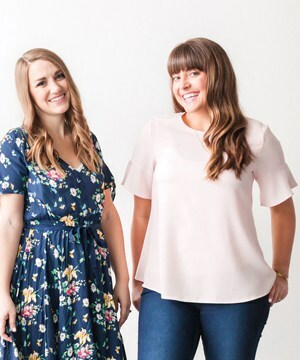 « Three Fashionable Lip Looks for Busy Mamas! GOOD DESIGN & GOOD PRICE ! 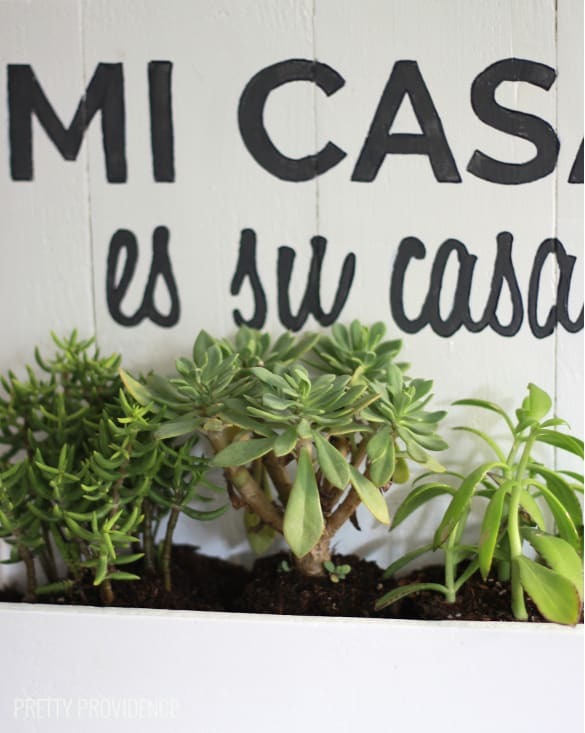 I love succulents because they don’t need a lot of fussing and care which is good for plants that live in my house. 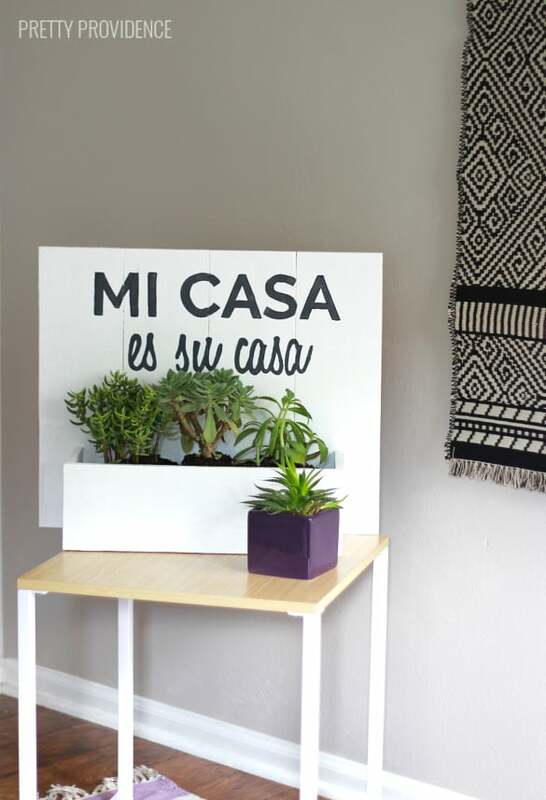 Cute saying too and this looks perfect for a guest room! Aw thank you so much!! And AMEN on the succulents! Perfect for the guest room – plus I just love black + white + green! Thank you so much!! I’m glad I’m not the only one who loves this color scheme! Turned out so cute! Love the saying on it for the guest room too! Thanks lady! You are so sweet!